Smoke detectors are used as an alert for smoke and fire in a home, but their ability to function effectively depends on their location. When determining the best areas for smoke detector placement, you must understand how smoke moves through the house. Mount smoke detectors to the ceiling because smoke naturally rises. Smoke accumulates in larger quantities overhead before it settles closer to the ground. When smoke detector placement on the ceiling is not practical, install it high on the wall close to the ceiling. Be sure to install the detector well away from any air vents that may blow smoke away. Early warning of fire depends on how quickly the detectors identify smoke. In your bedroom, you may be sleeping and less alert to signs of a fire. If a fire develops on one side of a closed door, for instance inside a bedroom, smoke may not reach detectors on the other side of the door. 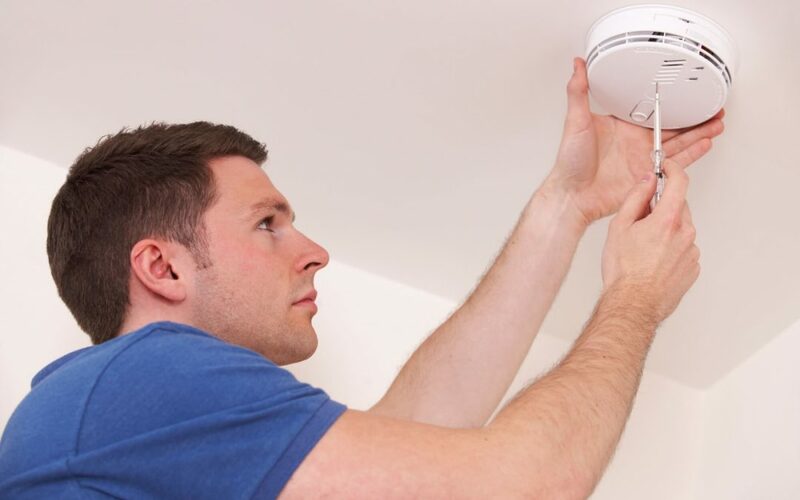 Install a smoke detector in each bedroom of your home. Installing one smoke detector in the hallway outside of a cluster of bedrooms is also important. By having smoke detectors on both sides of the bedroom doors, you will receive prompt notification regardless of where the fire develops. When determining ideal smoke detector placement, consider where fires are likely to break out. Clothes dryers use high heat to dry clothes quickly. The risk of a dryer fire increases when the lint trap is not cleaned regularly. More flammable material is present and the dryer can become super-heated when air cannot pass easily through the exhaust. Because of this risk, install a smoke detector in the laundry room. Another area of concern is the kitchen. Cooking and appliance fires are common, so a smoke detector in this area is essential. The smoke produced by cooking sometimes causes false alarms, so the best placement for a smoke detector in the kitchen is approximately ten feet from cooking appliances. Help your loved ones safely escape a fire by following these guidelines for proper smoke detector placement in your home. Once they are installed, remember to test the units monthly and replace the batteries as needed. Manor Home Inspection provides home inspection services to the Greater Boston area. Contact us to request an appointment.